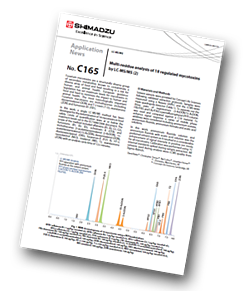 In this application note an optimised LC-MS/MS method for the detection of 18 regulated mycotoxins is presented. Mycotoxins are secondary metabolites produced by fungi. To reduce hazard risk, regulatory efforts have been made to monitor mycotoxin-contamination in food and feed. However, due to the physiochemical diversity of mycotoxins and presence of isomers, obtaining analyses with high sensitivity and resolution is often a challenge even on LC-MS/MS systems. Therefore, there is a demand for an optimised method for accurate quantitation of regulated mycotoxins in a single LC-MS/MS analysis. 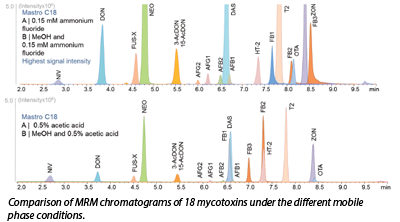 In this application note an optimised LC-MS/MS method for the detection of 18 regulated mycotoxins is presented. With the LCMS-8060 triple quadrupole mass spectrometer, LC conditions were optimised by evaluating a variety of mobile phases and LC columns. Using an ammonium fluoride mobile phase, increased ion signal intensity in the positive ion mode was observed compared to standard mobile phases. Comparison between columns also showed that PFP columns obtained better baseline resolution than the C18 column. Persistent fumonisin carryover was also addressed by mobile phase optimisation. With these optimised conditions, the method achieved high sensitivity and repeatability for mycotoxins in spice matrices with a cycle time of 12.5 minutes, and demonstrated LOQ below the maximum residue levels set by the European Union.